Dedicated Realty, Inc was established in 2005, and has been locally owned since its inception. With offices located at 223 East Sixth Street in Neoga and 111 East Jefferson Street in Sullivan, our agents serve a variety of counties in Central Illinois. At Dedicated Realty, we blend personal attention and local knowledge of the market with targeted advertising to both print and web media. We merge the best features of small local companies with the conveniences of major chain companies to serve our clients to the maximum degree. Listing with any real estate agent will allow your property to be placed on the MLS, which allows agents to easily search for your property to schedule showings for their buyer clients looking for homes that match your description. This also places your property on Realtor.com which is a site frequently used by home buyers. We go out of way to advertise on sites and in print where buyers from not only Sullivan, but a large surrounding area will see your property. Not only do we advertise weekly in the NewsProgress, but we also run a monthly ad in the Real Estate Book, which has a circulation including Mattoon, Charleston, Arcola, Casey, Greenup, Neoga, Toledo, and Tuscola as well as the Journal Gazette-Times Courier, which circulates in seven counties with a daily circulation of 12,773. Additionally, Dedicated Realty’s properties included on Realtor.com, but the company subscribes to a Showcase Package which allows additional pictures, featured showings, and a special delineation of our properties. We maintain our own website as well as a Facebook page, which allows you and your friends to share a link to your property. Finally, we advertise on Zillow, a rapidly growing searchable database of properties. Dedicated Realty invests in Sentrilock Lockboxes, which are electronic devices that work with the MLS to add convenience to area realtors who would like to show your property as well as peace of mind to the clients knowing that their home’s security is not compromised. All of this is accomplished while maintaining competitive commissions and excellent service. Despite all of these features, Dedicated Realty knows that personal attention is the most important. Our agents are professional at all times and respond to clients and potential clients in a timely manner. Any agent would be happy to sit down and discuss any real estate needs in more detail. 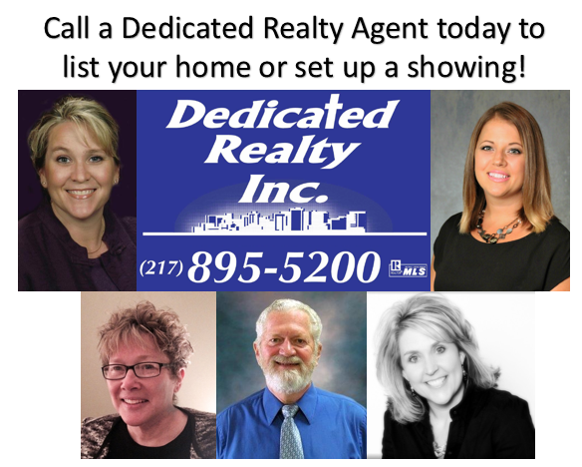 List your home with Dedicated Realty TODAY!